Well, the ‘third part of the journey’ (operation bad esophagus: enter, probe, cut. remove, stretch stomach, stitch…close) completed and successful well over a week ago. Now for recuperation. Recovery. Putting some meat on these bones. But not before ‘thank you’s’ to everyone for the healing, the hope, the love sent via prayers, visits, phone calls, cards, gifts. Family and old friends, local ministers (Rev. Michael Brecke and Rev. Phil Sweet, my two favorite men-of-the-cloth), shaman, astrologers, Native American medicine folk, meditation people of every belief. It all worked. Blessings. Yes, all the bigness of heart, wonder of words worked—plus the golden hands of surgeon, Dr. James Maloney, University of Wisconsin Hospital, who walked into my room one week after the operation and said I was ready to be released. Everything in order. The cancer gone. A new order/pathway intricately cleared to consumption, digestion, better health. A new man. A writer with a loss for words ? Guilty. How to honor and thank a man, a surgical artist, for handing your life back to you with a smile? “It’s not me,” he said. “It’s the team.” Teams of physicians I encountered from day one, months ago, at the UW Madison facility. I am forever thankful to all of them. To leave every aspect of ‘hospital stay’ behind, especially the air one breathes in such a state of lingering anticipation of confinement/release, the order of odors from medicinal to stale atmosphere…and to then suddenly walk away (be wheel-chaired away) from it all…find oneself sliding the car windows open on a journey back home…freedom, alive again, inhaling/exhaling deep gulps of rural Wisconsin pastures, fields, woods, wind, the possibility of thunder showers, the freshness of air breezing off lakes and rivers…oh sweet on-my-way-home-Wisconsin…dazed by cows and cattle, red barns, white farmhouses in the shade of old oak trees, corn fields, tractors turning up earth, hay bales, and horses lazily grazing in a bucolic dreamscape drifting into nap-time…my i-Pod plugged into Bach…my partner, my woman, my caretaker, Jude at the wheel, glancing at me every minute…”You okay?”…a pat on my hand. The smile I feel on my face, answer enough. To finally turn down the road I call mine, the road I can’t wait to be walking (maybe tomorrow?) again…to pull into the driveway, welcome the new lawn compliments of my son, Christo, and daughter, Bridget, after the new well destroyed my yard… Ah, the trees, the woods, the bird bath and feeder, my old rocking chair on the deck, the flowers in bloom…the very house itself, which I truly love, a perfect habitat…every room—kitchen, kitchen nook, dining room, study, upstairs bedrooms, cellar—every Persian rug, every piece of furniture, and pottery, all the art objects that hold my attention…my books, my beloved walls of books, soooo good to be back in my chair, everything I need within reach–pens, notebooks, scissors, stapler, magazines, newspapers, films, current books I am reading…phone, phonograph, i-Pod dock, television…all my clocks tick-tocking and striking (all the wrong time). Who cares? The time is now. Recuperation is a long word that stretches out for who know how many days, nights, weeks, months…? I welcome it, however long it takes. Just a little improvement each day will be fine. I sleep the first night in my La-Z-Boy, propped up at a thirty degree angle (as I must now for the rest of my life) and sleep good, well, perhaps even profound. My eyes open to early morning sun light drifting along the very tops of the beautiful white birch and maple trees across the road. I love to watch this play of light at dawn…how it drifts slowly down the tops of trees, from branches to trunk as the sun climbs higher above the great lake, and the smaller one at the end of my road. The front door open to cool morning air and the sound of birds. No one on the road at this hour. Nothing…nothing but the serenity of silence…natural sounds. That moment comes when I dress…a chore in this recuperation mode. Every move takes forever, brings a little pain. But I gather myself together the very first morning upon my return from the hospital and take to the road. The road which is already undergoing subtle change. The cool shadow of fall in the air. Leaves and grasses no longer expressing the bright freshness of May or June green, but grown old, tired, discolored, on their way to russet, amber. Some of the branches of the maples already exhibit transforming shades of green-yellow…green pink and bright red. Autumn, stealthily working its way across the landscape. My roadside, ditch garden has turned to mostly white Queen Ann’s Lace bobbing in a gentle breeze, some straggling blue corn flowers, purple clover, spikes of golden rod, and here and there black-eyed Susan’s taking a peek at me. So caught up in the moment, I am amazed to find myself completing my usual long walk (which I have not done in months), and on my way home again. As I approach the gravel driveway, I am aware of Jude in the kitchen getting my ‘liquid diet’ breakfast of juice and cream of wheat ready on the table in the nook. We will sit down together and eat, laugh, gossip, tell stories, make plans. Of all those in my thoughts throughout this health ordeal, she reigns supreme. I could not have made it this far without her ‘intensive care.’ All the time and energy she has devoted to me day after day, night after night, hospital after hospital. All my moaning an groaning, ups and downs. She has a better perspective on so many more things in life than I will ever have. I envy sometimes her pure joy in daily life. One small measure of thanks: I recently purchased a print for her by Mary Hamilton called “Simple Pleasures” at a local gallery. Every image in the print speaks of her. I wanted her to know that , “simple pleasures” is one of the things I most love about her…and all that she has brought to my life these past years. 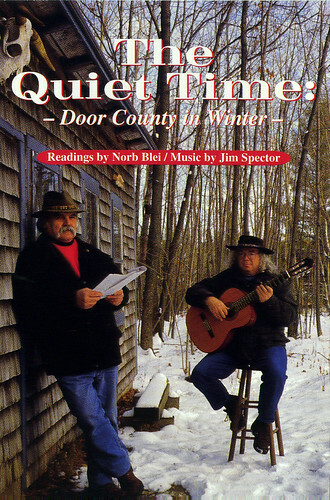 I am reminded too of our many simple picnics (“a loaf of bread, a jug of wine and thou singing in the wilderness”) which we have shared in our favorite Door County parks. 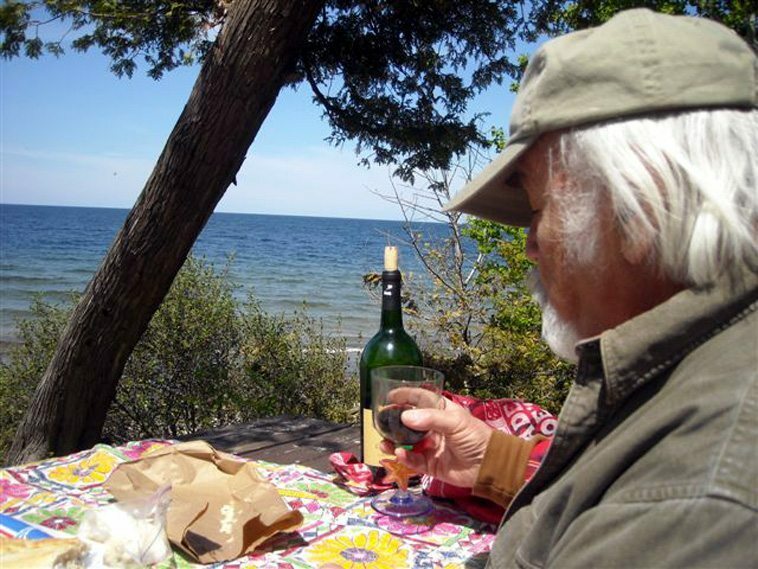 I long to be well enough, soon, to get back to that…to stop at Annie’s TOP SHELF gourmet shop in Sister Bay, buy a loaf of crusty fresh French bread, small portions of some exotic cheese, a bottle of wine…and head to a picnic bench in Peninsula or Newport Park. If I were to leave the planet tomorrow, may my last expression be a smile upon my face. Thank you so much for that lovely piece, which made me cry but was so reassuring, so profoundly life-affirming …I’ve been waiting sort of anxiously to hear about recuperation – which can be miserable. You are wise to focus on the many small but wonderful joys around you – and your good woman! And feel a little stronger each day. Already a long walk!! May it all continue, better and better…Love the print!. Hang in there. Recuperation can be a long and windy road, but it sounds like you’ve got a lot of people rooting for you, and that’s a major plus! Stick with the program. 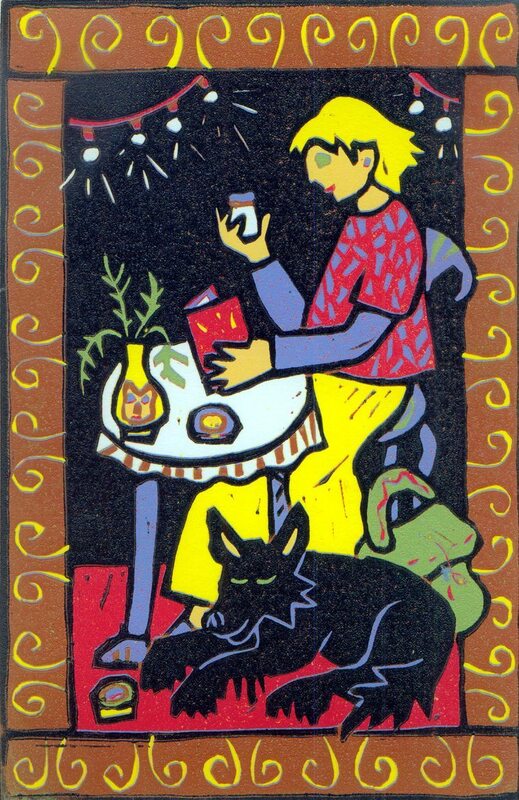 Good luck and good health to you. Halfway through this lovely, lovely piece (I should type peace) on comes Dinah Washington’s “What a Difference a Day Makes” and now I’m tearing up. Ahhhhh Norb…. your spirit and voice is strong. So glad that everything went well. Your writing dharma is in full, wing-expanding force with this eloquent, exquisite piece. The journey of pain and suffering brings the marvel of beauty and love that has always been there for us to enjoy, a gift of a simple moment’s breath we missed, when we were busy or haunted by desires and wants other than what we really need. It is being in the moment where we are graced with the treasures of life. I bow to your open heart, your bravery and your wonderful women who held your hand. Life knows many roads with twists and turns but that familiar one when coming home must have felt surely good. I remember you writing that often you caught yourself sitting at the window and looking out with remorse as you could not really walk that road as you used to. Now that the miracle has happened thanks to that surgeon and his team, and due to Jude, I just wish you the strength of Greek summer heat to recover. It is sun and a smile, blue water and a poetic dose like the shower you take after coming in from the salty sea and then compare with what awaits you, namely a good juice to refresh and to recuperate. So I am glad, man, that you made it home. Printed all that out to absorb more fully. Lee’s brother had that surgery at Vanderbilt a few years back. Fairly new procedure then. Keep us updated. Looking for more good news. I am so happy to hear this good news! Thanks. Glad it went well and is going well. Bread , cheese and wine.. it is that good! Bless you …we’ll see you when we see you. Thank you for sharing. It’s good to see you out and about- please visit on Wednesday’s and Friday’s I’ll help put meat on those bones with a donut or two.. Your wonderful spirit keeps shining through all of this… stay strong. So glad you have Jude, too. Great that you’re home and recuperating (a much more resonant word now, after reading this). We’ll have to visit the shrine if half-buried cadillacs in Texas next year. Snow will be on us, here on the Laramie Plains, within the next five weeks or so. At that point I’ll be bound to this place for the winter. But thinking of you cuz. Doze. Drink. Enjoy. Your words of your recovery and perspective remind me of the commentary spoken by Ben Stein yesterday on the CBS Sunday Morning program. His suggestion to the audience was inspired at seeing a falcon’s nest atop a railroad bridge near his home. The sight of it gave him joy and comfort. His hope is that we focus on the small pleasures of Nature and divert our emphasis from whatever is wrong in our lives. I always like the trumpet at the opening and closing of the show, and especially like the video of Nature, without voiceover, just before the trumpet sounds the show’s departure for the week. I needed this good news. Thank you, Norb, for not just telling us you’re better but taking us there with you. I sit here in my windowless office feeling connected with nature and with you. Hey, being home is the first big step. Recovery takes time, even under the best of circumstances. Great that you are getting GOOD SLEEP. A true blessing, take it from a chronic insomniac, who knows. Love the photo. I’ll toast one for you. First drink this month, nope second, I forgot the lone beer at the ballpark. Norb, so glad to see you back at the helm. Your piece is so full of life an love…inspiring as always. Onward, my friend! Hi…..I’m a huge fan of your dad and his books…any chance you could email me??? How does one paint a smile face on all that read your email? It is no doubt the most fantastic “Reward” for all that have prayed for your return to good health. To have gone so far.. toward what could have been the worst… and to return.. What could be better in this life? Good to know that Door County has you back up here; and that you found the best to care for you. Thank you for sharing your lovely intimate feelings of thanksgiving. We all rejoice! Norb … you are right up there at the top of the list of people/writers/artists who put strength and positive energy into my life. I think you for that, and am delighted to see your tough old bones made it through the medical ordeal and you are now walking your road again …. Norb…each time I type something here and hit “Add your comment”, everything vanishes! Damn. It’s a joy to read your account above. You’re among a handful of people whose very existence pumps white magic energy into my life, and I am happy you are back walking your road, my friend. So damned lucky to be the student. So pleased to hear you are OK.
Phil Sweet is right: “To love and to be loved ” that is the answer to the question. You have arrived at that place. Home again: that’s the place to be to patient-ly recuperate and appreciate what has been accomplished through caring friends and medical teams, and you, and Jude. It IS all Good. The man can flat write! Norb, you draw all of us right into your inner most thoughts. EVERY DAY is a gift to be enjoyed and shared. Thank you for sharing yours. Now that the recuperation is in full swing, it’s good to know that the ‘recooperation’ is also progressing nicely. So nice to have you back, old friend. I’m looking forward to my first Norb sighting, your car pulling up to Kubie’s, or maybe at the PO or the bank. Dear Norb . . . I, too, thank God for the surgeon’s skilled hands. He was caring for someone who’s dear to so many people. Norb, I was moved to tears when I read your hope-filled words. I breath a sigh of relief for you and Jude as you move from hospital mode to home mode…on the road recovery…better than “OK.,” Your illness seems to have sharpened your ability to imbibe the “simple pleasures” of life and describe them in a way that allows others to look with new eyes also. I could picture the scenes, smell the air, feel the breeze and take the walk down your road with you. You have my deepest thanks for being willing to share your intimate thoughts and feelings. They inspire me and give me hope. I continue to pray for you and Jude. As you move forward: “Adopt the pace of nature; her secret is patience.” Emerson. Thank you for reminding us all what to be truly thankful for in our world. We have been waiting to hear that you are in recovery mode.You are in our thoughts and hearts, and Jude too!! In celebration of your forthcoming Birthday my thoughts go to Kafka’s “Anyone who keeps the ability to see beauty never grows old.” Franz Kafka. Norb, you not only see beauty, you hear it, smell it, feel and love beauty and you magically express to your readers so that they too can experience the same joy. May your special spirit help you and be with you always as you continue your recuperation. Norb, i’m so glad to hear you are on the mend! What you have written is absolutely amazing!! Hopefully Mr. Halla and i can share a wine with you and Jude in November on our trek to the door! May you be filled with loving kindness, Peace, and ease!! So glad to hear you are home and recuperating, Norb. Finally! We’ve all been hanging on your every twitch and cough. Great to hear you enjoyed Red Lobster also and stiches out, recovery on it way. This piece was lovely and made me anxious to be in door in the fall. Stay well. You are both in our hearts. skilled team that kept you in our world a little longer. Comment probably not last, but certainly least among the chorus of voices…who sing praise on your return with a voice stronger than ever. Thank you JUDE!!!!!!!!!!!! You did it and you said you would! He is back home…. This great news came at a time when all I’ve heard for a while is bad news. Thank God for your recovery and for your gift of sharing what you see, feel, and experience on this journey back to yourself. One of my sons had an operation similar to yours and is doing well a few years later. Also grateful to be able to eat (small portions, more frequently) again. I’m looking forward to a new photo this winter and next spring of a fully recovered Norb walking his road in the midst of God’s blessings of spring flowers, rebirth and recovery. Thank you for sharing from your heart and soul. Soon it will be time to take you off the altar of the healer shaman here in New Mexico over looking the Sangre de Cristo mountains. Maybe time for a return to this place you love where the men of the kivas are still praying for you,I and the planet. Where the red and green chili rule. Where the adobe dwellings are warm, soft and flowing to the eye….. Your photo of the coop looks real good with the phone books on the floor ….. Clipping – For years my mother followed your writing and clipped every thing under the sun you wrote while in Chicago – I have a huge box to tons of words we shared. I think it might belong in the shed annex or sheds shed.